Situated in the settlement of Babići, Apartments & Rooms Villa Adamović is 1.3 km from the sea and 7 km from Umag’s centre. Enjoying a secluded location, it presents rooms with air conditioning and free internet access. A back yard with a seating area and grill invites to sit back. All rooms come with parquet floors and feature a balcony, satellite television and a private toilet with shower. A shared well-equipped kitchen is at guests’ disposal. The pizzeria dining establishment is just 100 metres away. The closest grocery store can be reached within 1 km, while other eating places are at a distance of 1.5 km. 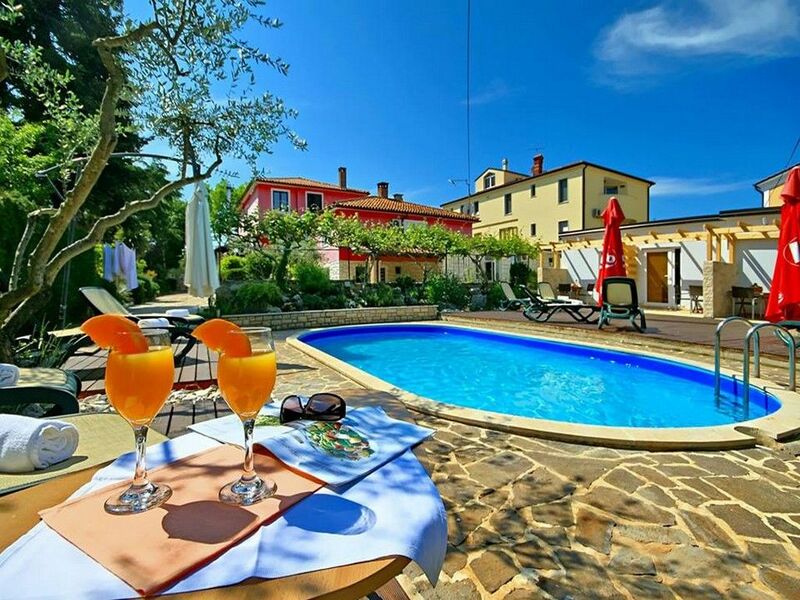 A bus stop with lines to Rovinj is 100 metres from Villa Adamović Apartments & Rooms. Tennis courts and ATP stadium are 8 kilometers away. Pula Flight terminal is at a distance of 80 km. Free car parking is possible on site and the property offers mountain bike rental service. Duba ( ~ 1.6 km ): 45+ accommodation units. Fiorini ( ~ 4.1 km ): 27+ accommodation units. Brtonigla ( ~ 5.8 km ): 16+ accommodation units. Karpinjan ( ~ 7.5 km ): 393+ accommodation units. Buje ( ~ 8.5 km ): 38+ accommodation units. Novigrad ( ~ 8.5 km ): 194+ apartments. Beach Ladin gaj, Umag ~ 3 km from Apartments & Rooms Villa Adamović Rocky beach: ideal for families, recommended for young people, awarded with blue flag, with restaurant, with caffe bar, equipped with showers. Excellent choice of watersports. Beach Katoro, Umag ~ 5,6 km from Apartments & Rooms Villa Adamović Gravel beach: ideal for families, recommended for young people, awarded with blue flag, with restaurant, with caffe bar, equipped with showers. Excellent choice of watersports. Beach Aurora, Umag ~ 6,8 km from Apartments & Rooms Villa Adamović Concrete beach: ideal for families, with restaurant, with caffe bar, equipped with showers. Excellent choice of watersports. Beach Laguna Stella Maris, Umag ~ 7 km from Apartments & Rooms Villa Adamović Gravel beach: ideal for families, awarded with blue flag, with restaurant, with caffe bar, equipped with showers. Excellent choice of watersports. Beach Karpinjan, Novigrad ~ 7,5 km from Apartments & Rooms Villa Adamović Gravel beach: ideal for families, with restaurant, with caffe bar, equipped with showers. Excellent choice of watersports. Restaurant Tavern Pizzeria Babici, Umag ~ 0,2 km from Apartments & Rooms Villa Adamović Address: Babici 12a, 52470, Umag. Cuisine: Croatian cuisine. Restaurant Zlatna Vala, Umag Guest reviews: 9,3/10 ~ 1,9 km from Apartments & Rooms Villa Adamović Address: Sv.Ivan 45, 52470, Umag.